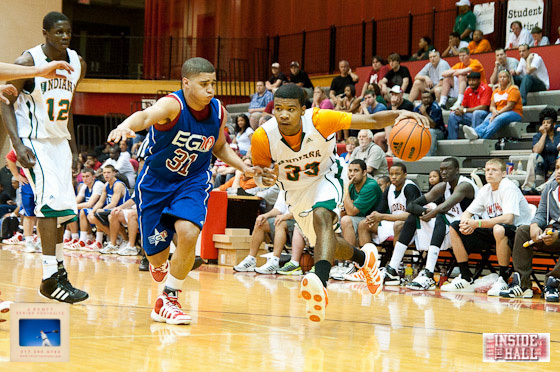 2012 Indiana signees Jeremy Hollowell, Hanner Mosquera-Perea and Ron Patterson will play in the 2012 Derby Festival Classic at Freedom Hall in Louisville on Friday, April 6. All three will be teammates on the White roster and will also participate in the Horseshoe Foundation Night of Future Stars on Thursday, April 5, at New Albany High School. Basketball Classic tickets are $11 and $16 (includes $1 facility fee) and are available at TicketMaster locations or ticketmaster.com, by phone (800-745-3000) or the Freedom Hall box office (502-367-5144). Full rosters are available after the jump. Can’t wait, living in Louisville, had my tickets already. Just wish Yogi was playing in the game. So, DSR decided on Georgetown. Huh. That reminds me — whatever happened to Moses Abraham? Does seem odd. I don’t know this for certain but I was under the impression DSR left North Central to bolster his school work while also developing his game. Georgetown is one of the best schools in the country, not easy to get into. How does a struggling student that can’t cut the mustard at North Central make it into one of the most prestigious schools in the entire world? Is this the root of Georgetown success in past decades, wave requirement for those that can ball? Notre Dame doesn’t do that, Stanford does not, Duke I don’t think so, who’s call was it at Georgetown to sell out and wave test score and grade requirements? I can see that at an average school but Georgetown is virtually Ivy League. exactly. Doesnt stuff like this make the ncaa a little sceptical. I guess hell be taking underwaterbasketweaving. I live in Louuisville and will be there to support the Hoosier Nation FOR SURE ! To be fair, I was in the same freshman class as Pat Ewing Jr., and I had friends who were in a few of the same classes as him and said that Ewing wasn’t exactly, um, “Georgetown-material” either. Does that mean Georgetown looks the other way on the test scores / grades of its athletes? Well, hopefully it means the opposite – that they have great programs in place to bring their kids up to the standards of their prestigious institution – but I’m skeptical until I hear otherwise. Now known as Moses Ayegba. A non-factor at the end of the bench at G-town. So glad we’re not burning a 4-year scholly on him in B-town. I don’t think Iverson was exactly pre-med. I said, “so, did he officially offer a scholarship?” and she said “I was told ‘Crean wants Bronson’.” In other words my wife (and whomever told her,) don’t exactly know how the process works. Maybe Alex and the ITH guys can find out if it was an offer. Freedom Hall? Why isn’t this game at the NEW YUM YUM Center downtown? Yogi is a McD All American right? Michigan is a pretty challenging school as well and their football players don’t seem all that bright. Many schools look the other way for athletes Georgetown, Michigan, even Notre Dame. Heck, IU isn’t too shabby academically and we have had some guys that probably aren’t that bright either. The same Ewing Jr. played for us too. That’s funny. I’ve seen pieces of several Georgetown games and I always make a point to look for him and I’ve never seen him playing. Oh what a difference a year makes. Correct. They’re only eligible to play in two “all-star type” games per year. 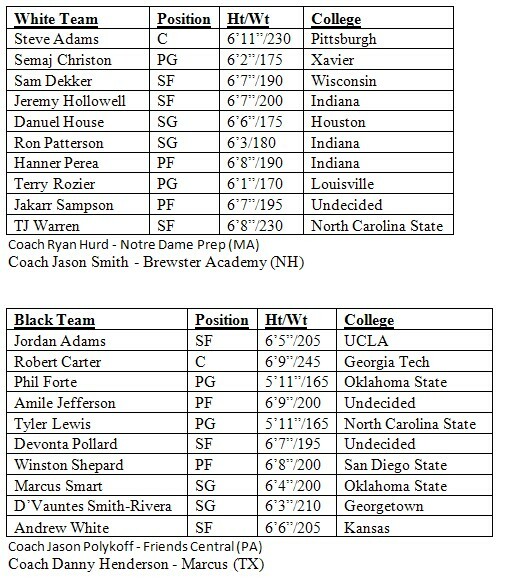 Since Yogi is already in the McDonald’s All-American game, along with the All-American Championship (along with Hanner & Jeremy), he is ineligible to participate in this one too. Freedom Hall is out near Churchill Downs. I don’t know if this has any connection, since the game is a Derby Festival event. I would feel fairly certain to guess the rent on the Hall is a lot lower than the Yum! Center. Is Perea really only 190!? He didn’t leave for academics be serious… he left to play against the top competition in the country on a nightly basis to boost his skills it was never about the grades he is a bright student. I’m just surprised that they haven’t put the old wreckin’ ball to Freedom Hall by now. It’s owned by the State Fair, so they still use it. I saw Train and Maroon 5 there in August.